I developed for one of my clients a set of frames that can beautifully showcase your young Artists best work, and then, easily opened up to change out the artwork with a new piece. I use metal turn-buttons on the back instead of fitting the artwork with points or brads. You can change the look whenever a new batch comes home from school. Best of all the artwork looks amazing when it’s showcased in a good-looking frame, and looks great on your walls. Buy real wood frames for this project, as the pressboard varieties don’t take the hardware well, and won’t be as successful. 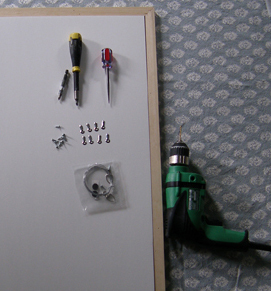 The wood grabs the screws better, and the frames are sturdier. See pics for tools and hardware needed. I recommend plexi for safety. A client I visited the other day, had a great display of framed work. 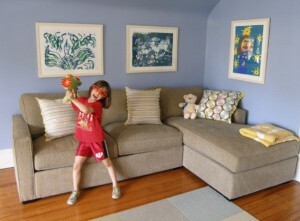 She used inexpensive frames from Ikea to showcase interesting papers that she had purchased. 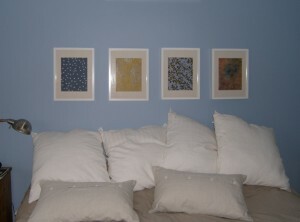 Often grouping a set of framed pieces will function like a larger piece of art. She used them over the bed, which creates the visual drama of a headboard, and the white frames match the bedroom scheme. 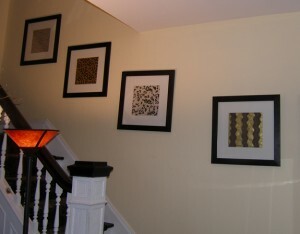 The same idea is used over the stairs, in black frames. 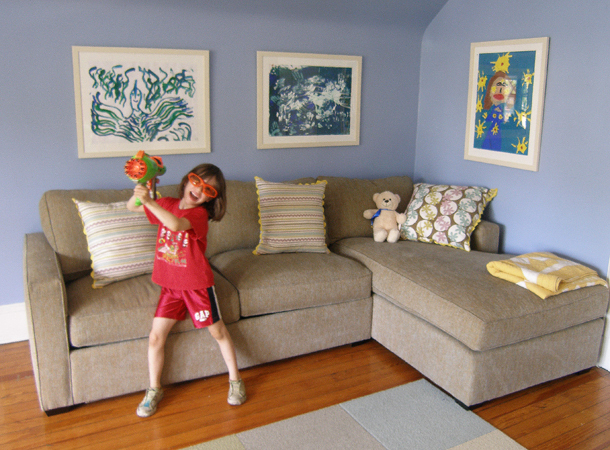 It’s an inexpensive way to get visual interest on the walls. And as you are not invested heavily into it, you can feel free to change at whim.